Filippo di Lagno (Angeli) a.k.a. 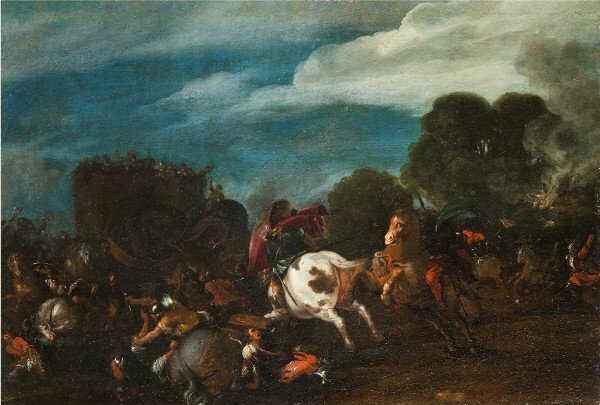 "Filippo Napoletano"
This brief and eccentric "war scene", with inspiration to the wars of Hannibal, was at first attributed to Agostino Tassi, whose path had to cross several times with that of Filippo, but never carried out, as noted, paintings of "battles". The safety paternity of Filippo Napoletano, already recognized in 1986 by M. Chiarini, author of the monograph on the master, and confirmed by me in 1999, it is clear on the type of powerful horses - the one on the right is almost a rampant initials - as well as its typical taste exhibition, fixing the images as a 'instant camera'. For a more detailed examination of this minor, but significant, painting please refer to the schedule established by Dr. Chiarini on the mentioned monograph.